We're not saying you're a gold digger. But you could follow the money to these 25 affluent cities, where singles are abundant. 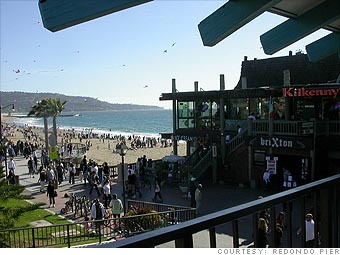 Oceanside real estate makes Redondo Beach one of the most expensive places to live in the country, so it's no surprise that the tanned beachgoers you'll find here are often part of a more affluent crowd. Take in a free concert on the pier, or search for hotties among the hot rods at a classic car show. Cyclists and runners also like to flock to the "esplanade," a popular seaside path. Three exclusive yacht clubs in the area cater to the upwardly mobile, offering sailing lessons, boat races and invitations to members-only parties and events. --A.C.